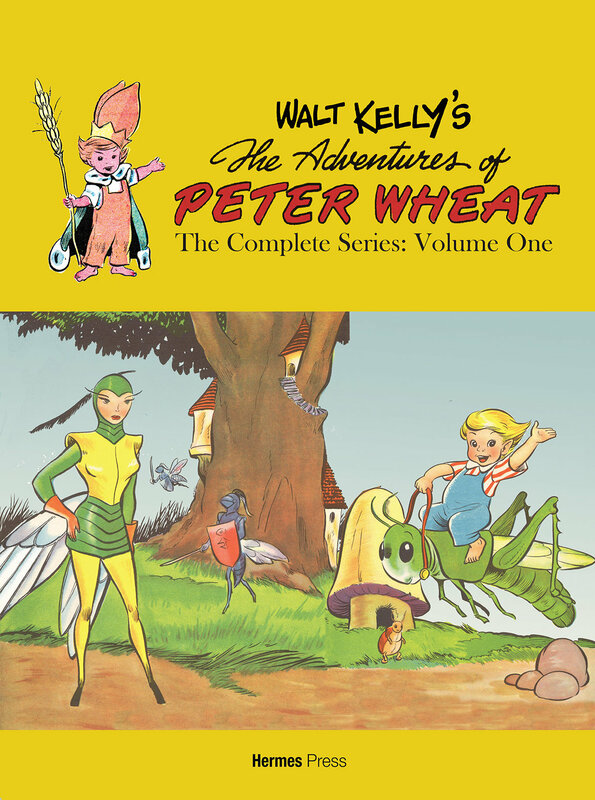 Walt Kelly’s Peter Wheat the Complete Series: Volume One; ISBN 978-1-61345-124-3; $34.99; paperback 272 pages; all color; All art and script by Walt Kelly; reprints the first 16 complete Peter Wheat comic books; in-depth essay by comics historian and Walt Kelly expert Dr. Thomas Andrae; afterword by Trina Robbins. Special “by order only” Diamond edition, hardcover with endpapers, printed laminated cover and dust jacket, to fit into your library with Hermes Press’ Walt Kelly’s Pogo The Complete Dell Comics Collection; ISBN 978-1-61345-125-0; $60. The Limited Edition “by order only” will only be available to order through Hermes Press and Diamond until January 15, 2017. Walt Kelly’s Peter Wheat comics are renowned for their humor, artistic flair and appeal to both children and adults. The Peter Wheat comic books are extremely hard to find and have never been collected as a series before, due to their scarcity and rarity. Between 1948 and 1951, Kelly drew thirty-five issues of The Adventures of Peter Wheat, a sixteen page comic book given away to bakeries to promote Peter Wheat bread. The stories were fairy tales starring Peter Wheat, an elf-sized boy who lived in a hollow tree on the edge of a wheat field where he and the Little Folk battle Dragonel, Queen of the Hornets. While created with kids in mind the mythology spun in these stories is timeless. “Coupled with Kelly’s incredible artwork, this series of stories, which run in arcs, are indispensable in Walt Kelly’s canon of work,” commented Dr. Thomas Andrae, editor of this series.